nor have I ever made Hollandaise sauce. please excuse my gushing about it. What an experience it was! April and May are the peak months when artichoke prices are most attractive. 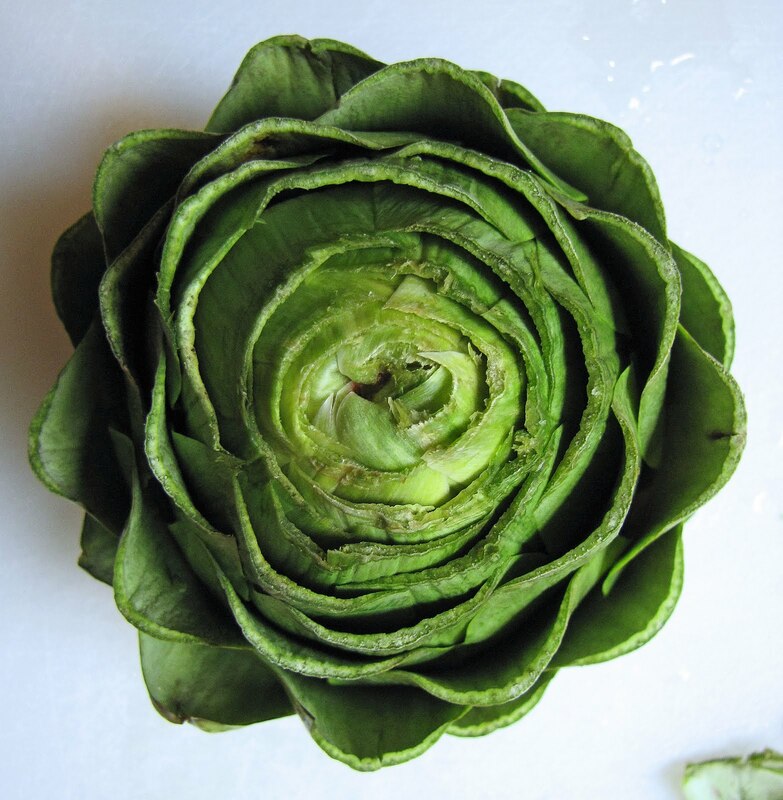 with fleshy, closely clinging leaves of a good, green color all the way to the tips. which are about 4 1/2 inches high and 4 - 4 1/2 inches at its largest diameter. 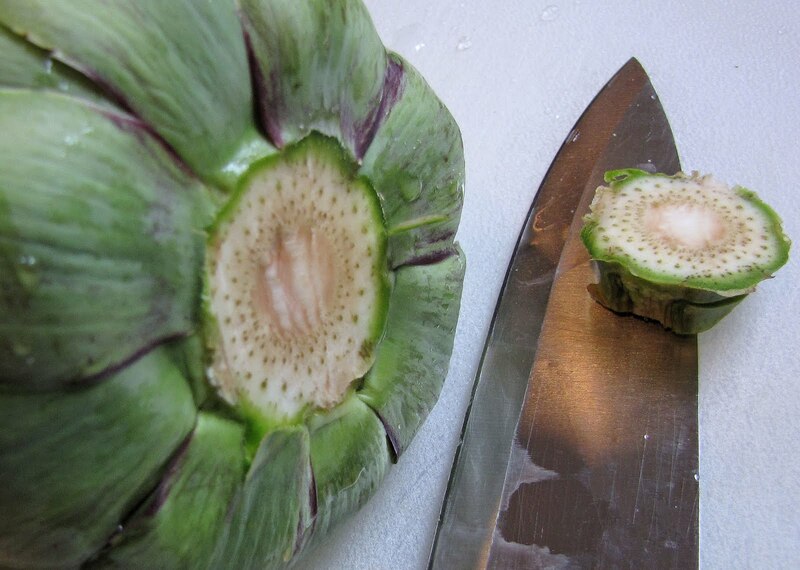 Remove the stem by bending it at the base until it snaps off. Break off the small leaves at the base. 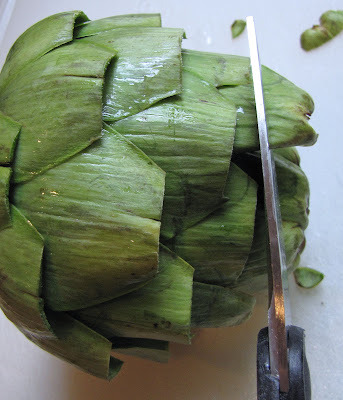 Trim the artichoke base with a knife, so it will stand solidly upright. Lay the artichoke on its side and trim the off the ends of the leaves with scissors. Rub cut portion with lemon. Drop artichokes in cold water containing 1 TBSP. vinegar per quart of water. 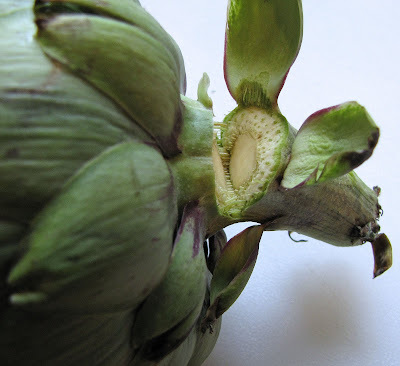 This keeps the artichoke from discoloring. Drop artichokes in boiling salted water (1 1/2 tsp. salt per quart). 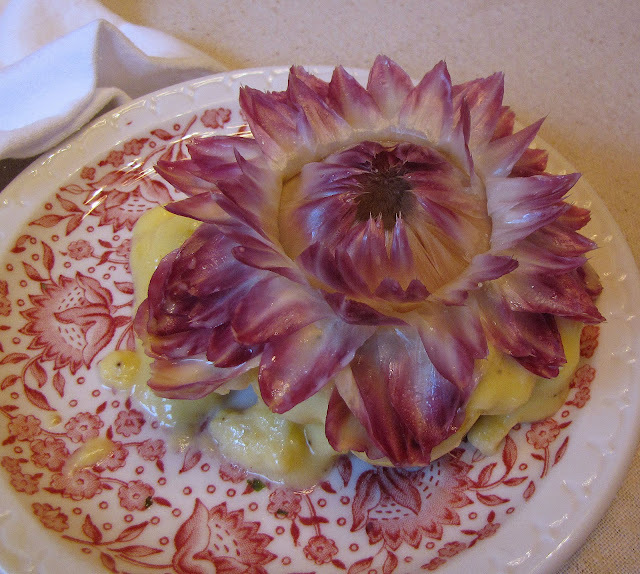 Julia told me to use a cheese cloth to cover the artichokes, all I had was a napkin. This is to keep the tops moist while they are cooking. Cook, boiling slowly for 35-45 minutes. They are done when the leaves pull out easily. 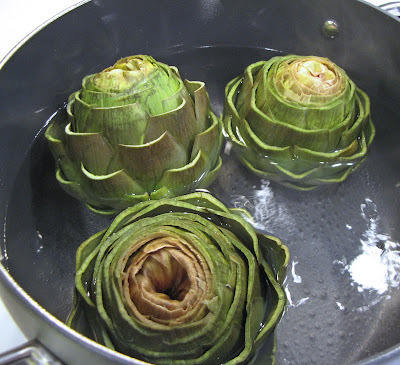 Remove them from pot, and turn them upside down to drain in a colander. 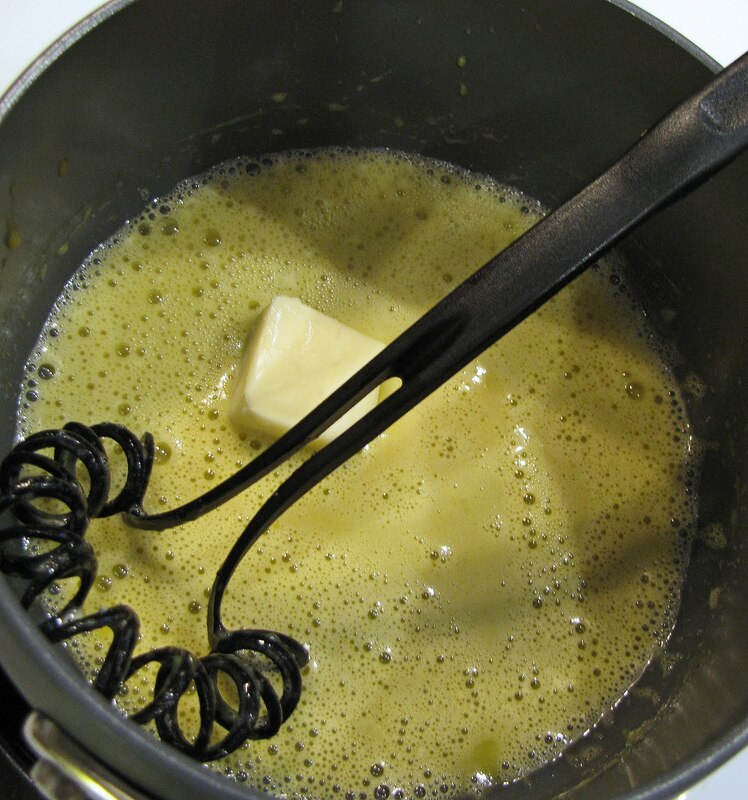 You'll need a small saucepan, a slightly larger saucepan for this recipe and a whisk. Melt cut butter pieces in small saucepan, and set aside. In other saucepan, whisk the yolks for about a minute, until they become stick and thicky. Add the water, lemon juice, and salt and beat 30 seconds. Add 1 TBSP. cold butter, but do not beat it in. Place pan over low heat (my stove: 2 1/2 on the dial) and whisk until they thicken into a smooth cream. 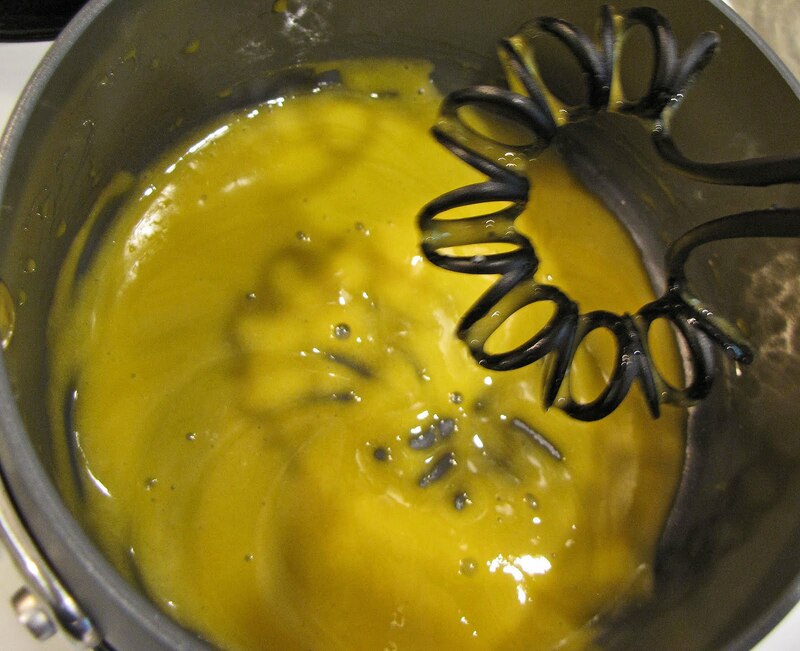 The egg yolks have thickened enough when you can begin to see the bottom of the pan between strokes. 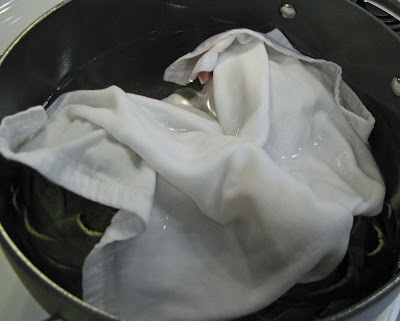 Immediately remove from heat and beat in the other 1 TBSP. 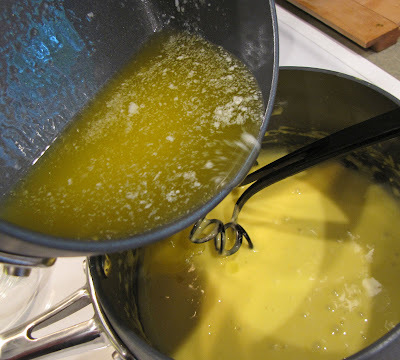 of cold butter, this cools the yolks and stops their cooking. 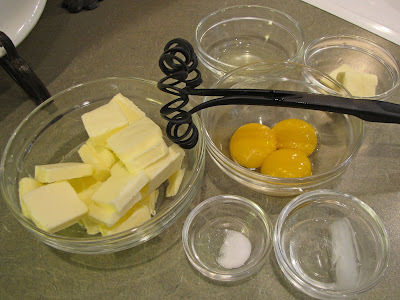 Then, add butter, very slowly, whisking all the while to the yolks. 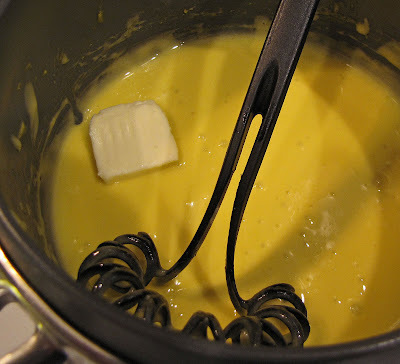 Do not add the milky residue from the butter to the mixture. Season the sauce to taste with salt, pepper, and lemon juice. Admire my creation! 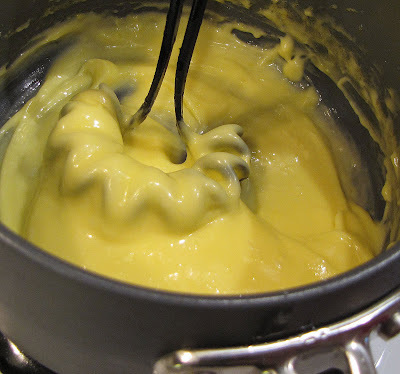 My very first hollandaise! 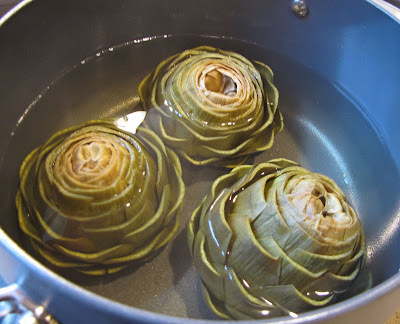 Using tongs, pull out the center of the artichokes, and fill with sauce, sprinkle with parsley. Pull off leaves and hold its tip in your fingers. Dip the bottom of the leaf in the sauce. Scrape off the tender flesh with your teeth. 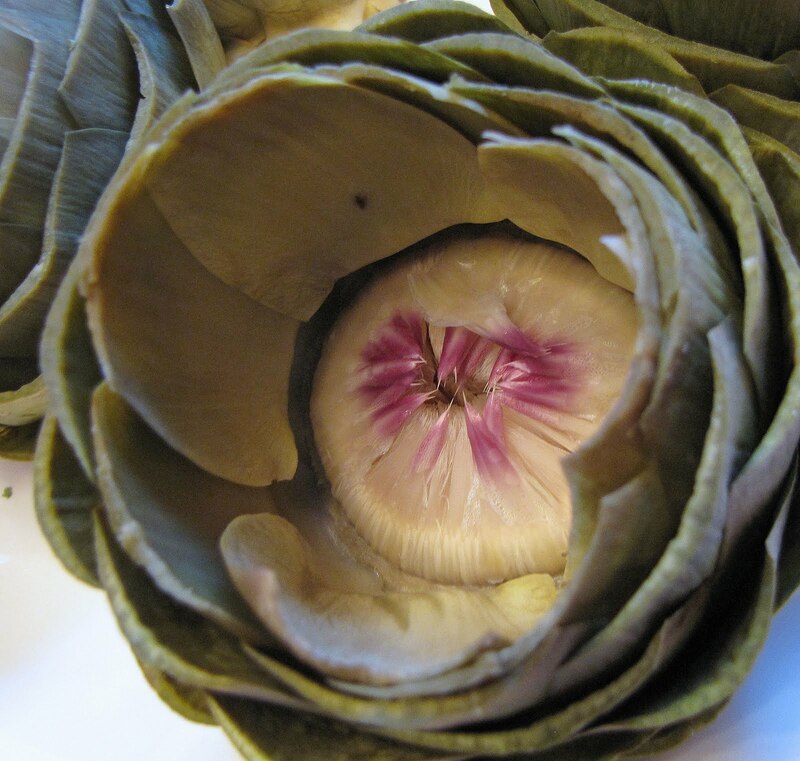 When the leaves are all gone, you will find the heart leftover, which you can eat after you have scraped off the choke (the hairy center growth). 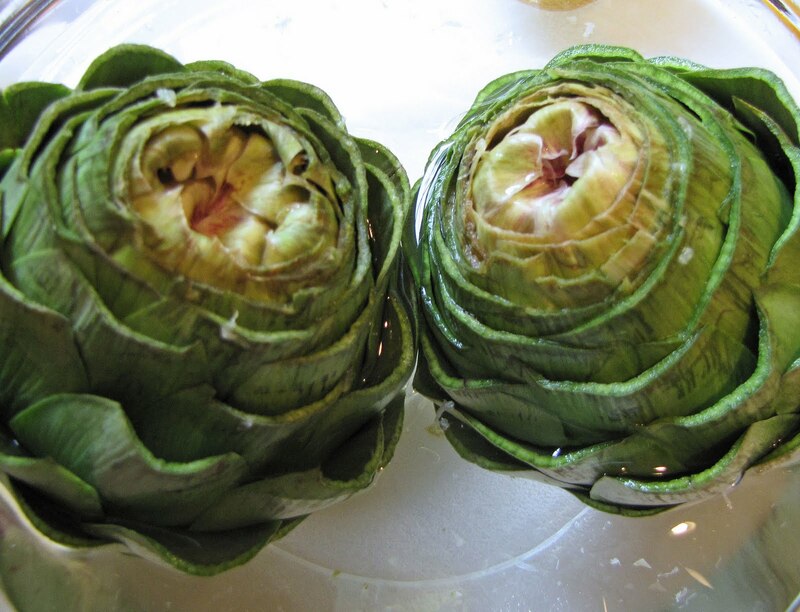 in the middle of an artichoke for us to find?" and I was taking pictures. So, maybe it would have been made more quickly if those three factors hadn't existed. believe me honey, this tasted NOTHING like those! I used organic artichokes that I found on sale for $1.50 each at Whole Foods. These were by far the most interesting appetizers I think I have ever made. I decided to make this for the next round of victims guests that come for dinner. they were actually very fun to prepare! They were fun to eat and the sauce was heavenly! I wanted to take a bath in it. And yet again, it's probably due to all the butter. 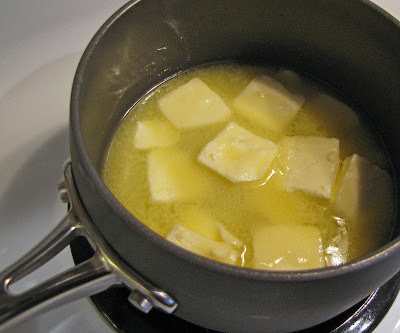 Next week, I will attempt to make something that contains no butter at all. Our cholesterol is probably high tonight! while testing everything for this cookbook. so one can hope that this food won't kill us yet. Like I say, we only eat this way one day a week. 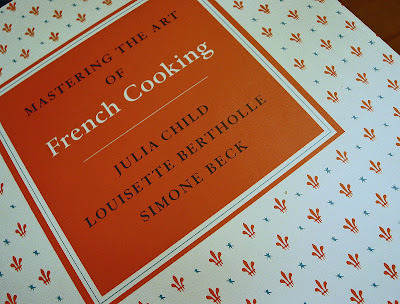 I was so excited reading this post because I just won this cookbook in a blog giveaway. Although I was happy I won, the entire idea of French cooking is very intimidating. Now I will be following you prior to trying each recipe! anything with that much butter had got to be good. 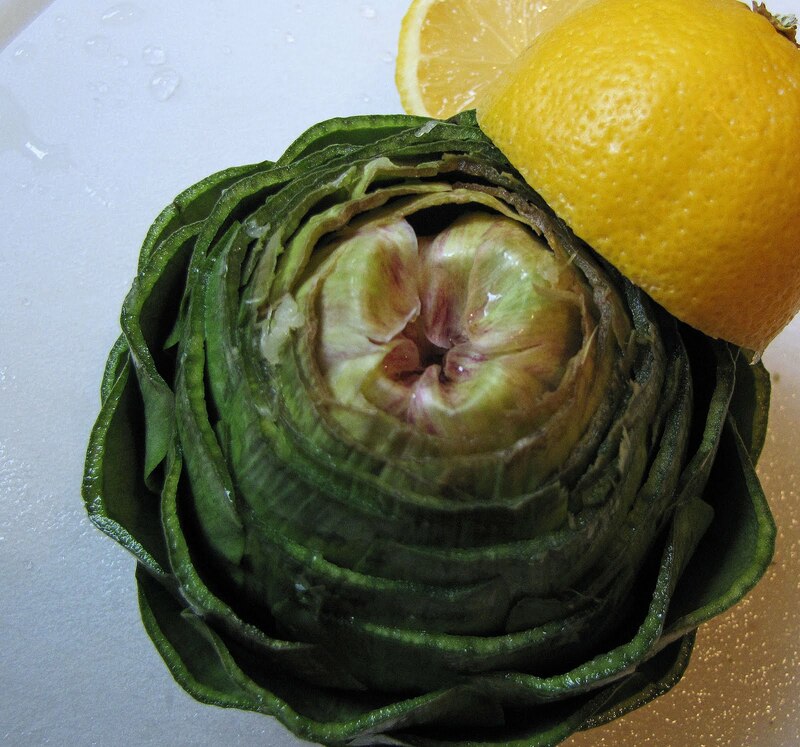 i've never cooked an artichoke or hollandaise either. 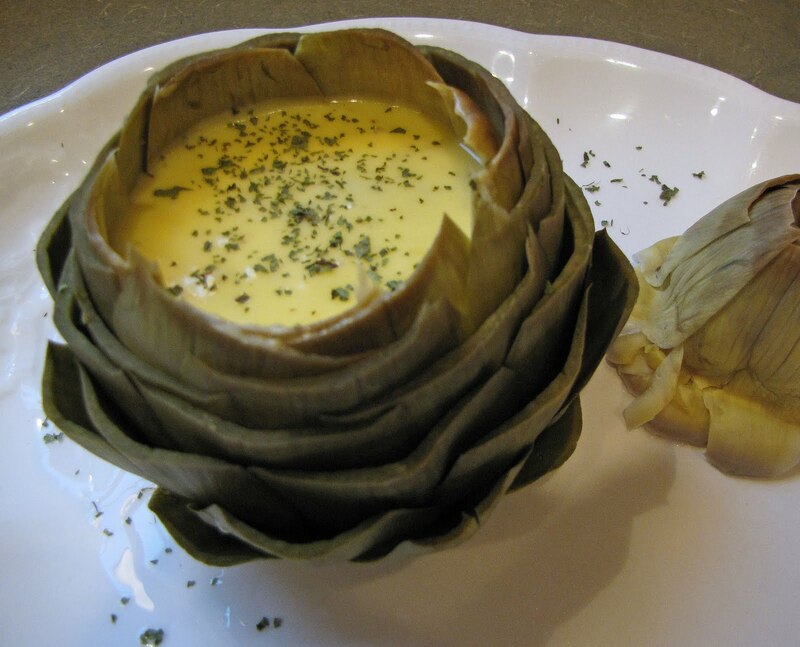 i love artichoke dip, does that count? to answer your question on my blog, we met out in NC while working for Young Life. we got married and then moved to TX. that's our story. in my earlier comment i meant to say "has got" instead of had got. oops. Looks delish! 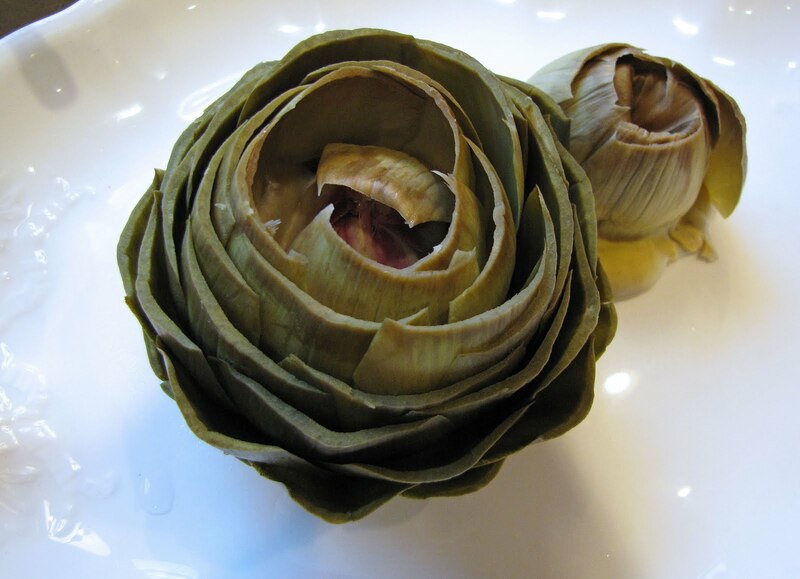 My mom used to make artichokes all the time but not with that yummy sauce. I don't remember seeing that pretty flower! I should give it a try, just to see the flower! That looks amazing!! 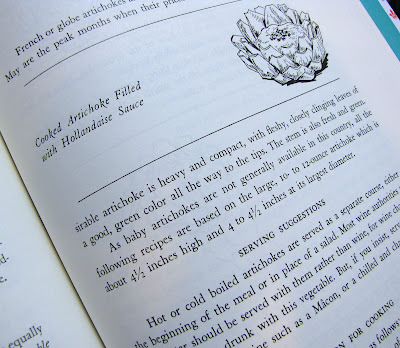 I have never cooked an artichoke or made hollaindaise sauce either. Gotta give it a shot...they are so yummy! I have this cookbook, and I am embarrassed to say I have never made anything from it. I am going to find something I think I can do! Thank you so much for coming by my blog. What an awesome post and great tutorial! Looks delicious! The photos are beautiful...or is it the food that's beautiful? I believe it's both and throw in the beautiful blogger cook lady, too!! Julia drank wine, I believe. Wine cuts the fat/grease. Most likely the reason she lived so long??? On Friday I made stuffed artichokes with parmesan cheese! Great minds! What can I say?! Sounds really challenging...but very rewarding! I have never even thought about cooking those before...but it looks so lovely!! I'll have to stop back here one day when I have the notion to do something really neet for some guests!